I teach at a church preschool where all the children celebrate Christmas, needless to say; we do a lot of Christmas themed activities in the last month of the year. However, this is really the first time I have been in a school where we celebrated one holiday tradition so obviously. I know that many of you do not celebrate Christmas in your home or classroom and I have been trying to find crafts that are winter themed that can be used by families and schools that do and don’t focus on Christmas at this time of year. 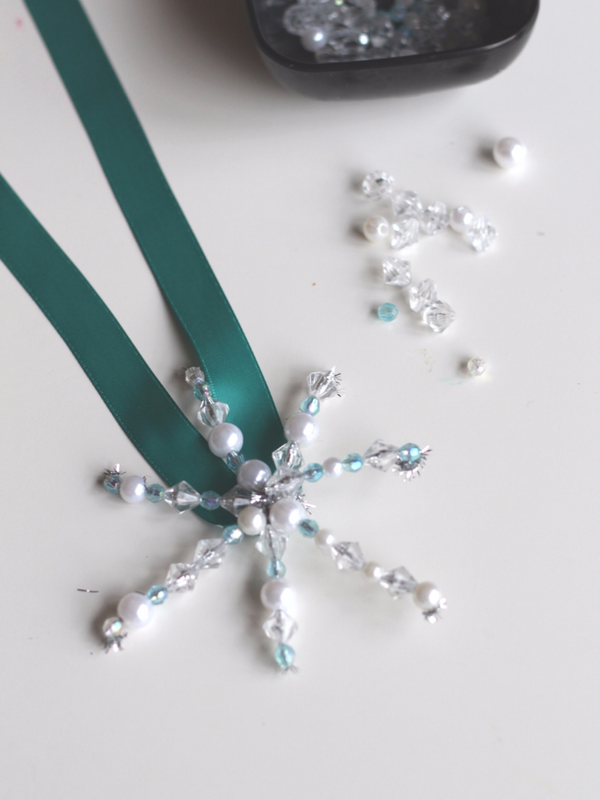 Bead snowflakes are a great choice; I don’t think they can be used as an ornament on a Christmas tree, but it can also be hung in a classroom or home window to welcome winter. Gather your materials. 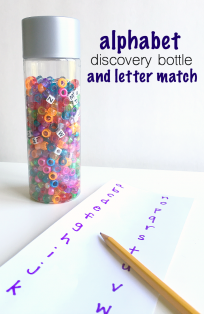 You will need some plastic beads, silver pipe cleaners, scissors, and ribbon. Hot glue gun to add the ribbon. 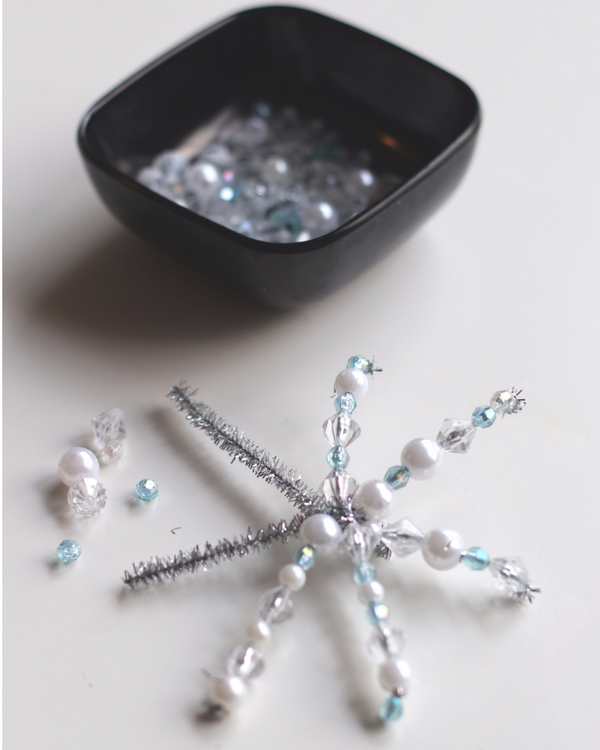 Make a snowflake from the pipe cleaners by twisting them carefully around each other. I did that step the night before. 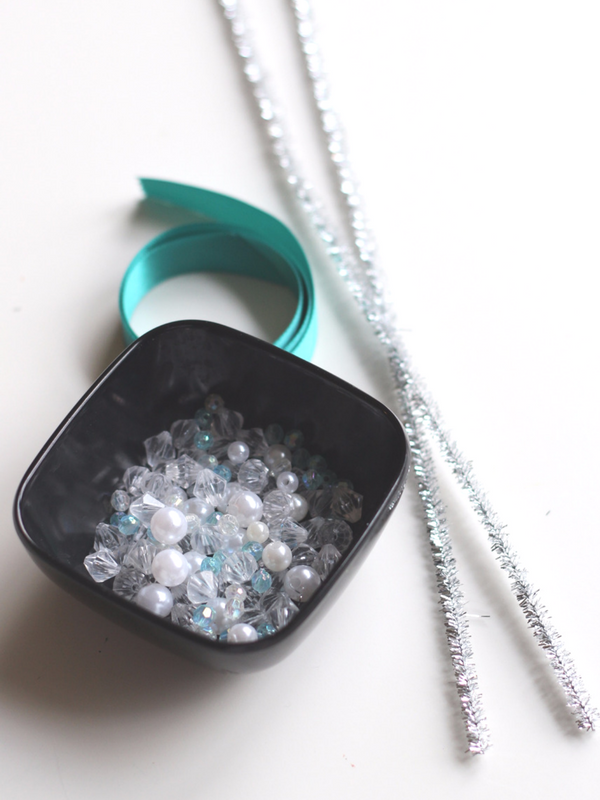 Pop the beads into a small bowl and start beading. 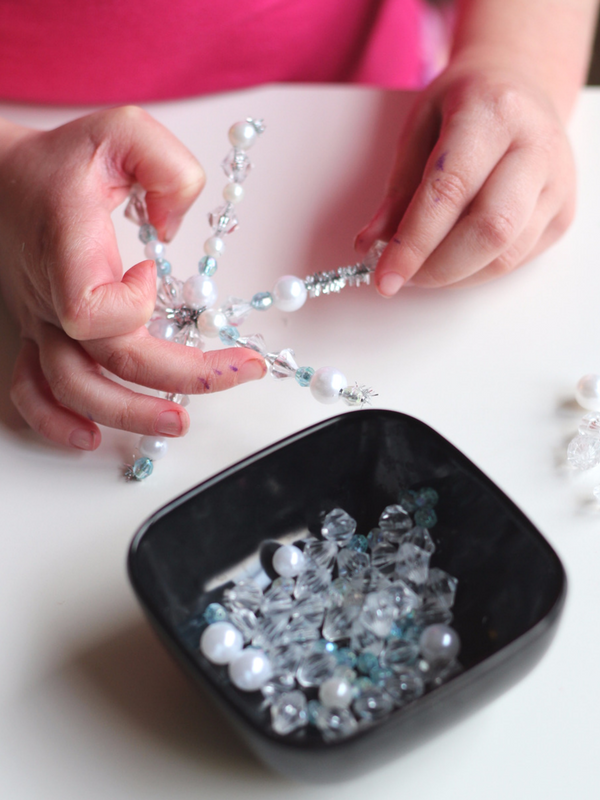 The pipe cleaners should stop the beads from rolling everywhere so even little hands can thread them on and not worry about the beads falling off before you bend the ends. Tell the children to leave some room at the end of each spoke, but if they don’t, you can just remove a bead or two. 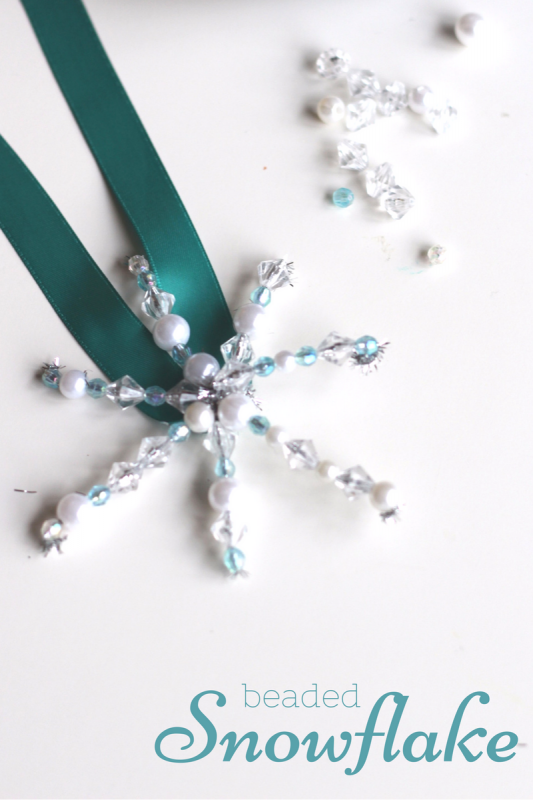 For younger children who don’t have the dexterity to hold the premade snowflake they can also make “icicles” and you can twist them into a snowflake or leave them as is. If I had two kids at home, I’d be twisting it into snowflakes, but in a class of twenty, I think we might end up with an icicle display, that’s a lot of twisting! 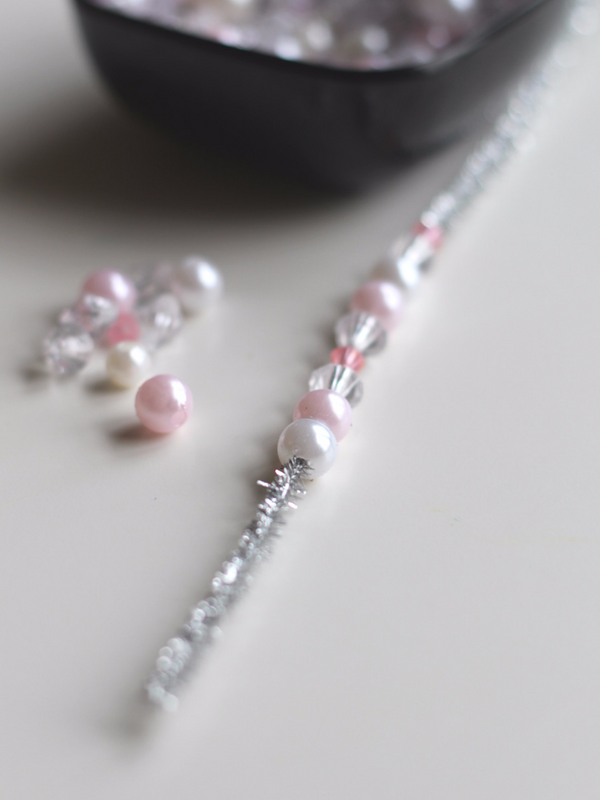 Beading is such a wonderful activity for little hands, it encourages gentleness, it refines fine motor skills, and often even encourages counting and pattern making too. 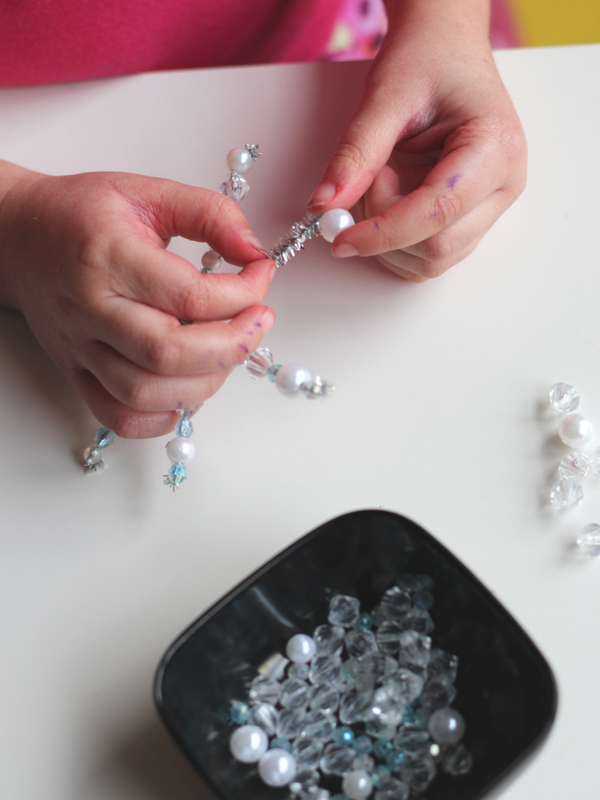 Whether you make icicles or snowflakes all those benefits will still be a part of this activity. Twist the ends and use some hot glue right in the middle to add the ribbon to hang in your window, if you want this to be a Christmas ornament you can skip the ribbon and just stick it in the tree, at least that’s what we did! 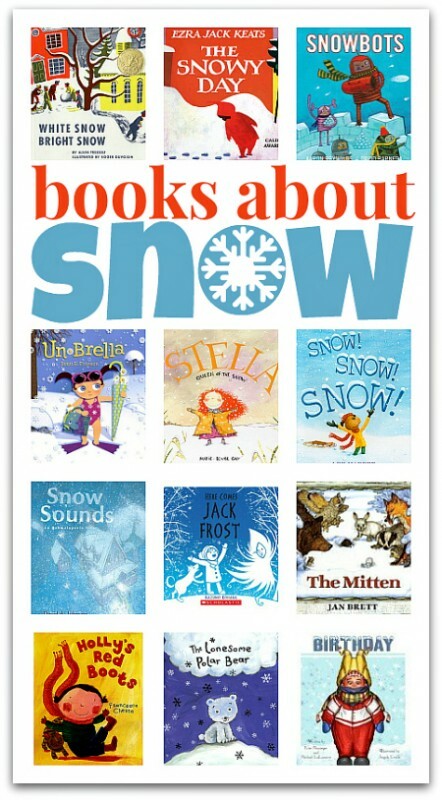 Need some books to read about snow before making these? Check out some favorites here! Love these! I am in New Zealand where it’s Summer at Christmas so the focus is strawberries & sunshine at Christmas. However next year my daughter is desperate for a Frozen party and I think these snowflakes will be the chosen craft for the day! We made these snowflakes up here in Montana this week. The children were very creative, some making patterns with the beads, and they didn’t want to stop! I had intended to use them to decorate our classroom, but the kids pleaded to take them home. So we made more the next day…and the next! Very beautiful. I also want to tell you I am forwarding your issue about materials for diversity to the director of our school. 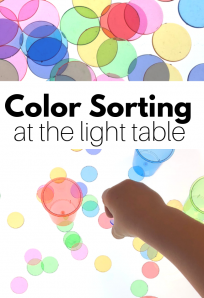 Oh I am so happy to hear that the children loved them, and thank you for sharing the diverse materials post!